Everyone knows antioxidants are good for you, right? Here’s a quick and delicious smoothie loaded with these powerful free radical scavengers. In the world of antioxidants, the darker the food, typically the higher its antioxidant properties. Fruit such as acai (pronounced “ah-SAH-ee”) and blueberry get their color from pigments known as anthocyanins. These antioxidant rich anthocyanins are vital to good health. Acai is extremely rich in antioxidants, minerals, vitamins, and contains 19 different amino acids. It’s particularly high in calcium, phosphorus, beta-carotene, and vitamin E.
Native to the Amazon, locals have consumed it for years because of its health promoting properties. These health benefits include boosting energy, helping with weight loss, supporting a healthy heart, healthy skin, reducing cholesterol, and aiding digestion and detoxification. You can use acai powder and juice in your smoothies, but I prefer the puree smoothie packs. They’re not too expensive and are quick and easy to add to your smoothie. 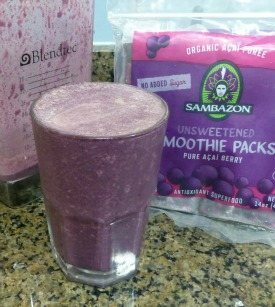 The 3.5 ounce Sambazon organic pure acai smoothie packs, as seen in the picture above, are what I generally use to incorporate this superfood into my smoothies. Note, if you don’t have the most powerful blender, blend the frozen ingredients first, then add and blend the coconut oil and honey. They have a tendency to clump when coming into contact with the frozen fruit. Enjoy! I’d love to know if you tried this acai antioxidant smoothie – please do tell in the comments below. Happy Blending! Excellent very good although I left out the sweetener, I will make this again. Glad you liked it, Don. I should probably make that sweetener optional.